MCLEAN, VA--(Marketwired - Feb 18, 2016) - Freddie Mac (OTCQB: FMCC) today released the results of its Primary Mortgage Market Survey® (PMMS®), showing fixed mortgage rates unchanged from the previous week and remaining near their 2015 lows. 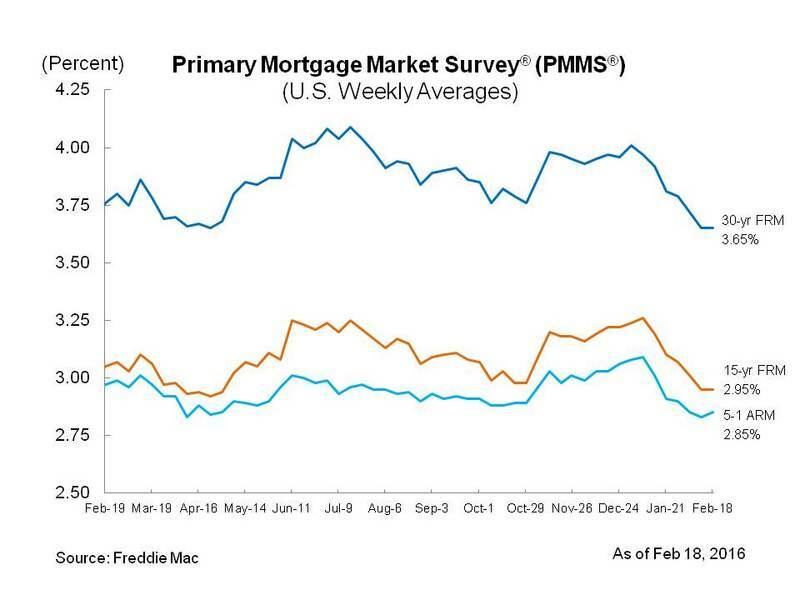 "After another week of financial market oscillations driven by rumors of potential limits on oil production, the 10-year Treasury yield edged up 5 basis points, and the 30-year mortgage rate remained unchanged at 3.65 percent. 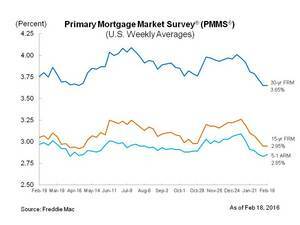 Despite this week's uptick in Treasury yields, the 10-year is still 54 basis points lower than it stood at the end of 2015, while the mortgage rate has dropped only 36 basis points over the same period." Freddie Mac was established by Congress in 1970 to provide liquidity, stability and affordability to the nation's residential mortgage markets. Freddie Mac supports communities across the nation by providing mortgage capital to lenders. Today Freddie Mac is making home possible for one in four home borrowers and is the largest source of financing for multifamily housing. Additional information is available at FreddieMac.com, Twitter @FreddieMac and Freddie Mac's blog FreddieMac.com/blog.